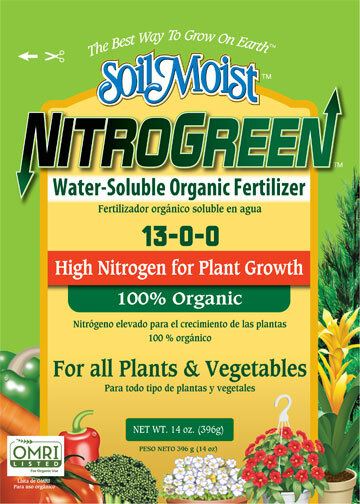 NitroGreen is a 100% organic based fertilizer that can be used on all plants and vegetables. The all-purpose fertilizer is 100% water soluble and goes into solution quickly to ensure immediate delivery of its nutrients. The OMRI approved fertilizer has the highest nitrogen available in the industry which is essential for plant growth and establishment. There are no harsh ingredients in NitroGreen that will burn plants. The fertilizer is normally applied as a water solution but can be applied dry. NitroGreen is packaged in attractive 14oz. bags with a shelf display containing six packages.